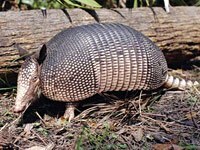 An armadillo is a mammal with hard leather on the back. 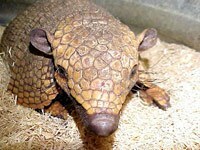 It dwells under the ground and most of them are nocturnal, sleeping during the days and hunting at nights. To run away from its predators, it curls up in a ball and rolls away. 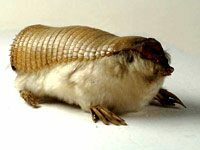 What does an armadillo look like? 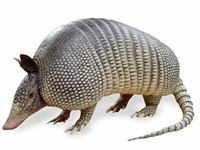 What does the word armadillo mean? 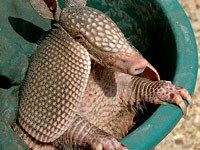 How much sleep does an armadillo get? 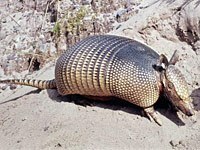 Armadillos are actually the second laziest animals in the world. First come the sloths, which sleep for 23 hours in a day, armadillos sleep for 22 hours a day followed by the opossum which sleeps for 21 hours a day. Download free Armadillo wallpapers, click on the image to open the large version. Print free Armadillo coloring pages, click on the image to open the large version.